A little over a month ago, I turned 30. Apparently something around this time is supposed to happen with my biological clock, but instead of a sudden, wild desire to domesticate myself, I realized with horror that I had somehow gone 30 years as an obsessive cinema fan without having seen Orson Welles’ landmark film, Citizen Kane (1941). THE SHAME! 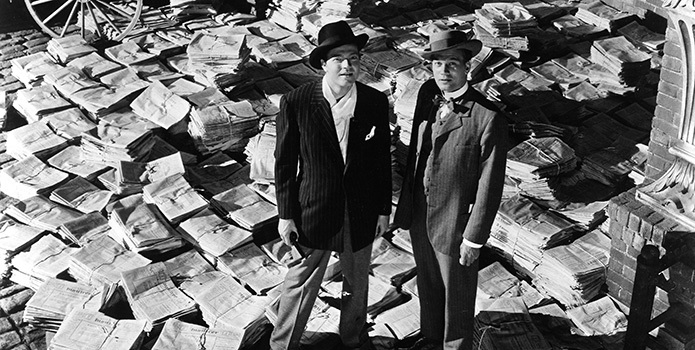 Citizen Kane relates the life of newspaper mogul Charles Foster Kane. Much of the film is concerned with Kane’s dying words, “Rosebud,” and numerous people’s attempts to discover what the phrase means by interviewing his old friends and business associates, as well as his two ex-wives. 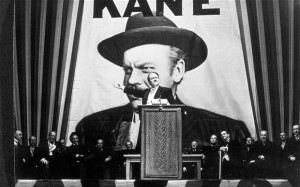 The film jumps between various points of Kane’s life: his penniless childhood, promising youth where he began a newspaper despite contrary advice from his business manager, the growth of his business and his rise to power, his two marriages, a failed political career, and the later construction and decay of his estate, Xanadu. There is not much I can say about Citizen Kane that already hasn’t been said. It is truly a masterpiece and while I feel the “greatest film ever made” moniker is both asinine and unfair, Citizen Kane is certainly high on the list. It is incredible to think that this was made by a 26 year old, let alone a first time director. Though Welles had a lot of success with theater and radio, including his wonderful and inspired work with the Mercury Players, Citizen Kane was his first cinematic experiment and he produced, directed, co-wrote, and starred. Welles teamed up with screenwriter Herman J. Mankiewicz to create a complex, multifaceted, and thoroughly non-linear tale bound together with interviews, flashbacks, newsreels and headlines, stories from multiple points of view, using different narrators for the first time, and from different periods throughout the characters’ lives. There is an epic, almost mythic scope to the film. The dialogue is fast and witty, but the non-linear plot and characters rapidly switching back and forth between younger and older aspects of themselves might be confusing for first time viewers. The age makeup by Maurice Seiderman does look fantastic, particularly on Welles himself. I think it took me so long to see the film because I assumed it would be dull in parts, overly long and overly serious. I could not have been more wrong. It has this magical quality where it seems almost completely untouched by time. That is likely due to the fact that it is such an influential film and many of Welles’ and cinematographer Gregg Toland’s techniques are used constantly throughout American cinema. The film is essentially a mystery, with “Rosebud” as little more than a device that Hitchcock referred to as the MacGuffin, a means to distract us from the real issue at hand. It doesn’t matter who or what Rosebud is, but it represents the indescribable feeling of longing that is an essential part of so much American art. In many ways this is a cold film, concerned with loneliness, isolation, yearning for an impossible ideal, and the concept that we can never really know another person. The film tries to present every aspect of Charles Foster Kane, but only succeeds in making him more mysterious and intangible. Citizen Kane only becomes more awe inspiring with increased viewings. There are a number of innovations, including Toland’s cinematography techniques, namely his use of deep focus and low angle shots, the use of ceilings, which were previously excluded from films, Bernard Herrmann’s incredibly score, Welles’ use of sound and radio montage techniques, and so on. There’s also the excellent editing work from Robert Wise, who would go on to become a director in his own right (The Haunting, The Body Snatcher, West Side Story). Nearly every part of Citizen Kane is controversial and helps explain why Welles, whether you think he was a genius or merely skilled at balancing on the shoulders of other more talented men, was never again given this large a budget or as much creative control. For starters, he was inspired by the life of media mogul William Randall Hearst, who was so enraged by the film that he tried to get the prints destroyed and caused an almost total media blackout. 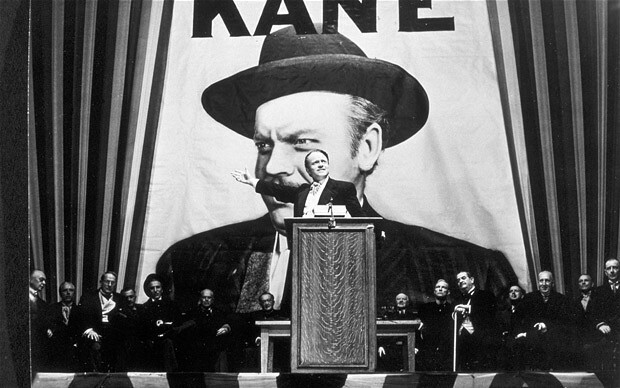 Despite how antagonistic Welles was towards Hearst, he was not the only inspiration for Kane. He is a mix of well-known public figures, namely businessmen and important news tycoons, but also Welles himself. It was also believed that Mankiewicz was responsible for the bulk of the script, though it is now accepted that some of the ideas were Welles’ own. His friend and Federal Theater Project collaborator, producer John Houseman, also contributed to early drafts of the script. A similar controversy surrounds cinematographer Gregg Toland, who offered to teach Welles everything he needed to know about shooting a film in one weekend and instead made possibly the most innovative film in American cinema. Throughout Citizen Kane’s torrid production history, it is sometimes unclear where credit is really due. Though the film was not a financial success and was forgotten after a few years, film critics help to revive it and it has been remembered as a classic since the ‘50s and ‘60s. It comes with the highest possible recommendation and is a work worth watching repeatedly. It’s a shame Citizen Kane crippled Welles’ career and he was never again given the freedom to make a second project of the same scope, hubris, and imagination.